He said that bilateral hatreds and quarrels or ulterior motives must not creep into considerations of threats to peace and security or the principle of responsibility to protect. The African Union would spare no energies complementing the Organization so that peace returned to Libya, but to selectively and arbitrarily apply the responsibility to protect merely undermined its general acceptability. There was now a disgraceful scramble by some NATO countries for Libyan oil, indicating that the real motive for “blatant illegal, brutal and callous” bombing sorties was to control and own the country’s abundant fuel resources. 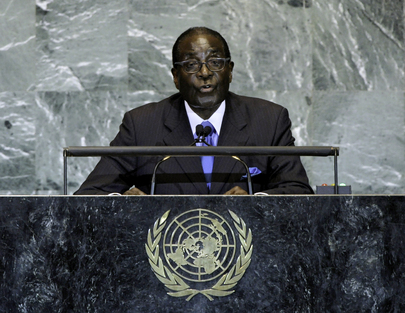 “When we in Zimbabwe sought to redress the ills of colonialism and racism by fully acquiring our natural resources, mainly our land and minerals, we were, and still are, subjected to unparalleled vilification and pernicious economic sanctions, the false reasons alleged being violations of the rule of law, human rights and democracy,” he said. Zimbabwe’s people condemned those illegal sanctions, and thanked the Southern African Development Community (SADC) and the African Union for demanding their immediate removal. Africans were also concerned about the International Criminal Court, which seemed to exist only for alleged offenders of the developing world, the majority of them Africans. Leaders of powerful Western States guilty of international crimes were routinely ignored, thereby eroding the Court’s credibility. Africa cannot remain the only region without permanent membership in the Security Council, he said, also urging reform of the international financial architecture to enable timely response to the real needs of the most vulnerable, developing countries. Zimbabwe also fully supported Palestine’s right to statehood and membership in the Organization. “The UN must become credible by welcoming into its blossom all those whose right to attain sovereign independence and freedom from occupation and colonialism is legitimate. Similarly, the tormented people of the Saharawi Arab Democratic Republic must not be forgotten. We call for immediate progress in the engagements for a solution to their long-running saga,” he said.